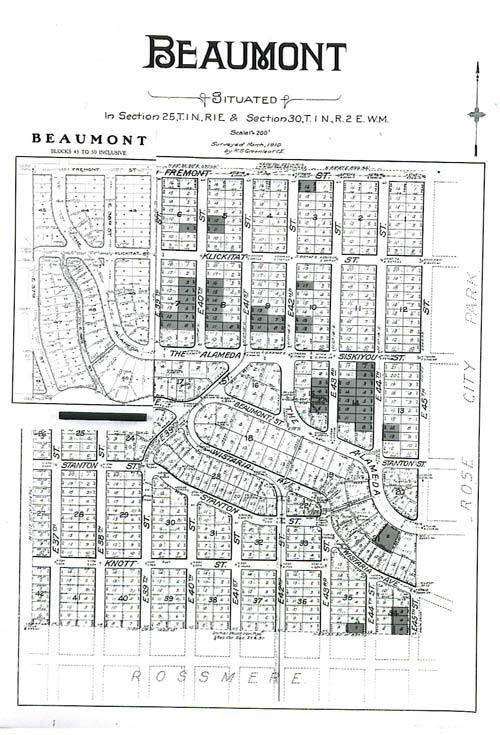 Here is a selection of some of our favorite subdivision plats and maps of the neighborhood. Some are large files and might take a moment to load. Click on the map for a larger image, or to download a copy. 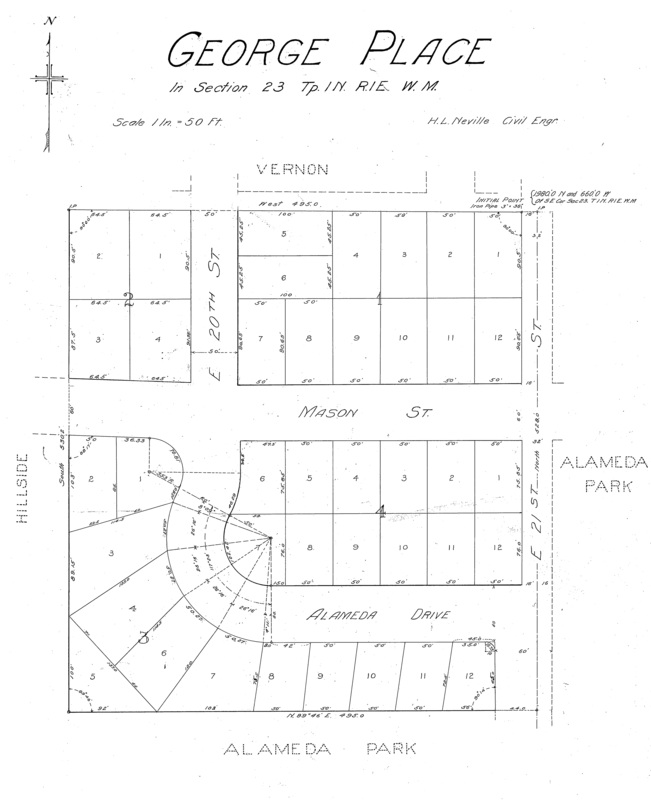 This early plat map of a portion of the neighborhood was created in 1910 by the Alameda Land Company and used in its original marketing materials. 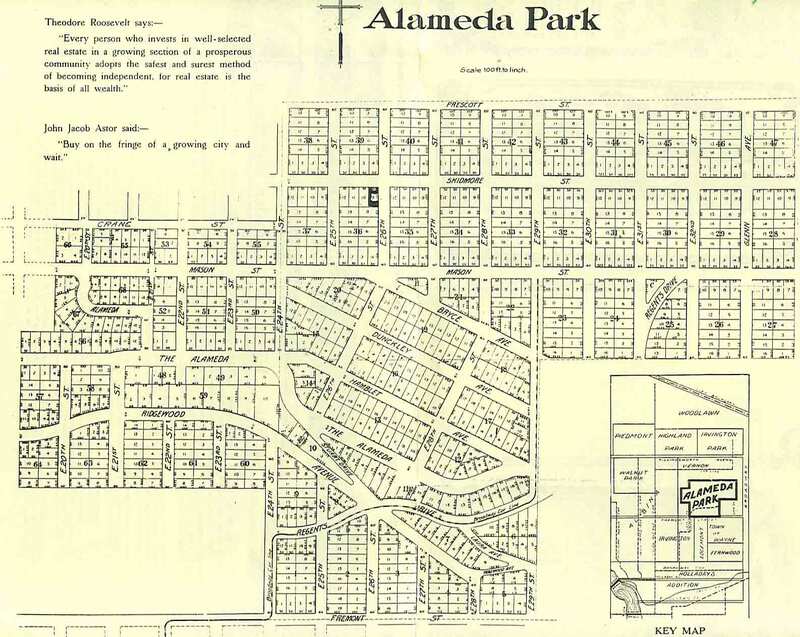 This plat shows the Alameda Park Addition, but clearly misses big chunks of today’s Alameda, which were added in the teens and twenties through new plats known as Pearson’s Addition, the Fremont Addition, Olmstead Park, Irvindale, Dunsmeade and the Miami Addition. By 1915, at least 900 plats had been filed in Portland, many of which were much smaller than Alameda Park, and all were named by developers searching for an attractive sounding name. While in some areas the plats have retained their distinct personality and name, like Alameda, the identity of many smaller plats in our neighborhood have dissolved into the more commonly used neighborhood name of Alameda. The plat names remain today on title documents and land records for these areas. 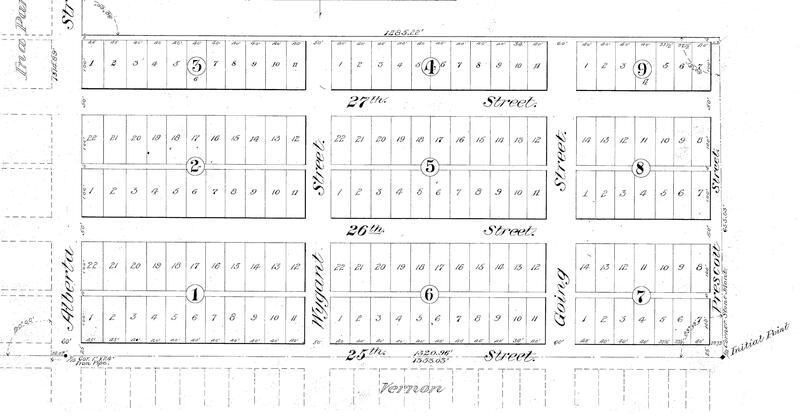 You’ll note that many of the lots we know today are shaped differently than in the original plat. But the streets, and the Broadway Streetcar line, are in the right place. This map does not have addresses, but if it did, the addresses would not make much sense to Alamedans today. The entire city was re-addressed in the early 1930s. 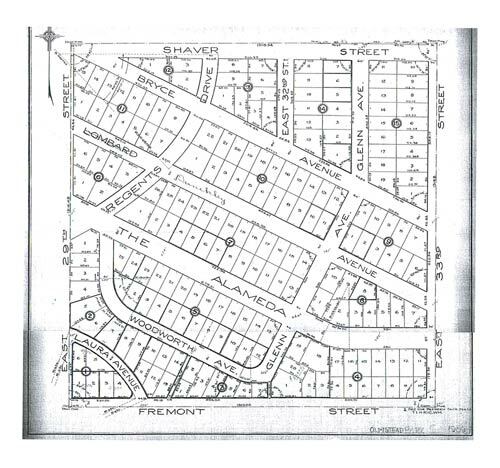 Click here for an article in the Alameda Stories that sheds light on the “great renumbering” of the 1930s, and the background behind our street names. Some amazingly detailed fire insurance maps of the neighborhood were drawn up by the Sanborn Company in 1924. Click here for an illustrated article I’ve written about the Sanborn maps and a link to the maps themselves. Between Fremont and Knott, from 39th to 45th, platted in 1910. Between Alberta and Prescott, from 28th to 33rd. Platted in 1906. A tiny plat that takes in what we might think of today as southwest Alameda Park. It was platted in 1910 by Horace C. and Mary George. Albion L. Gile — partner in the Gile Investment Company — and his wife Katherine, financed and platted a 1921 addition on the west side of the neighborhood straddling the ridgeline, near the alley-like street that bears their name today. The Giles were a prominent Astoria family. Most of the houses on this street were built by local builder Harry Phillips, and designed by Portland architect Harry Wolff. Between Alberta and Prescott, from 25th to 27th. Platted in 1906. Between Shaver and Fremont, from 29th to 33rd. Platted in 1909. 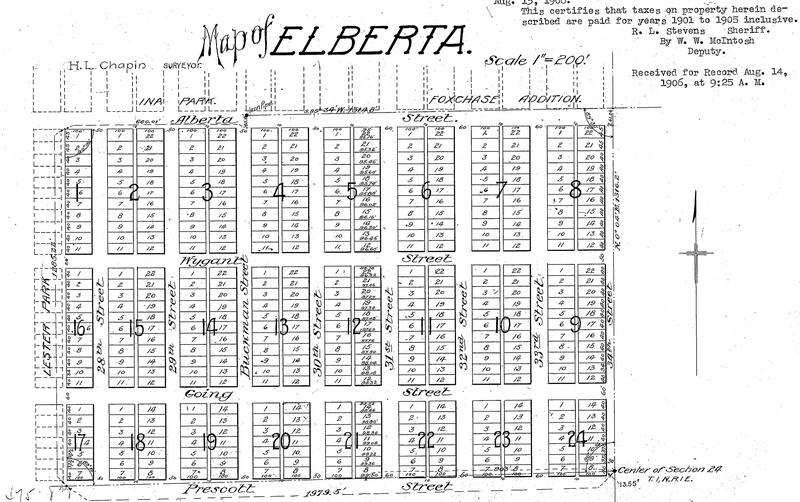 Here’s the cadastral map from 1909 showing the Olmstead Park plat. This roughly five-block square area is north of the Alameda Ridge and tucks in under the southeast corner of Alameda Park. Today this part of the neighborhood is clearly considered part of the Alameda District. Out on the ground even in 1911, these two brand new districts were indistinguishable, interwoven by the same streets, the same water, gas and sewer mains, and many of the same architects and builders who were beginning to populate this area with homes. For more information, see the post about Olmstead Park. Between Killingsworth and Prescott from 15th to 25th. Platted in 1903. Here’s a “replat” of Vernon, made after the initial filing that shows that portion of Vernon south of Prescott, including the mysterious shrinking Crane Street. This part of the neighborhood was platted in 1921. This plat of Wilshire is helpful because you can see where all the neighboring other plats connect. If you’re having a look at this one, be sure to read the post about the Prescott Jog. Alameda does not yet appear on this map. The location of today’s neighborhood is in the southwest quarter of Section 24. Irvington is in place, with NE 24th Avenue as its eastern boundary. There are several nearby subdivisions showing that were never built. 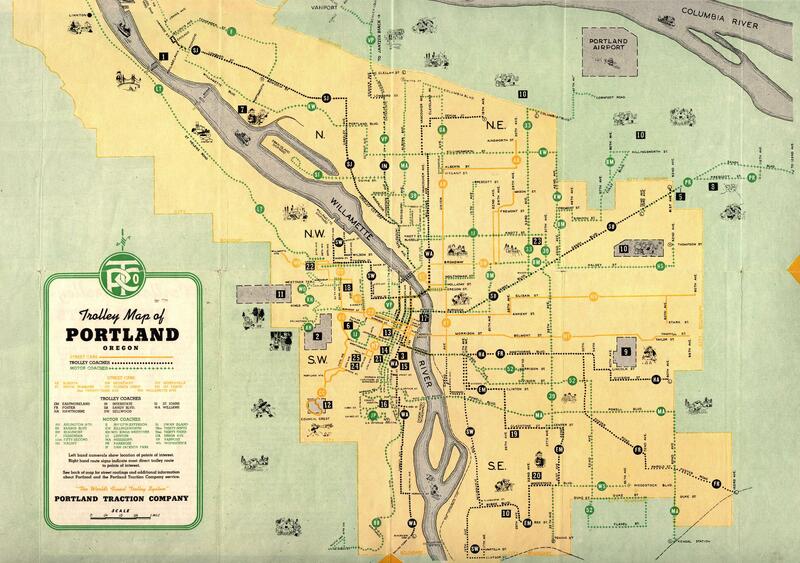 A high resolution copy of this map is available to be downloaded from the City of Portland Archives. The streetcar system evolved in the first two decades of the 20th Century and peaked in the mid 1920s with routes that covered much of the city and beyond. Here’s the system map from 1945, a time when most of the streetcar routes were on their way out. Look carefully and you can see the distinction between streetcar, trolley and motor coach routes. For other streetcar routes and information, check out this great website, operated by Portland Vintage Trolleys. Do you know if Alameda was once referred to as ‘Gravel Hill’, or the ‘Highlands’? I looked through several weeks of the Oregonian from 8/2/1898 to 9/8/1898 and read about a fire on, or visible from Gravel Hill, and/ or the Highlands, but no street address. The article was one short paragraph. It mentioned some names that I didn’t write down and don’t recall. I wondered if the hill or the ‘Highlands’ might be a previous set of names for Alameda because the article said something about Sullivan’s Gulch, either that the fire was extinguished with water from there, or that people took refuge there. I’ve read that Alameda Hill was formed by gravel left by floods (Bretz? ), so I wondered if Alameda might be the Gravel Hill referred to in the article. Thanks for stopping by for a visit. I am intrigued to know more about the article you read. Did you by chance make a copy or do you have the date and page? Yes, Gravel Hill was the name of the high point at today’s NE 33rd and Fremont. For many years there was a gravel pit of sorts on the southwest corner of that intersection which was also used as a garbage dump. There would have been a great view from that spot out across the flats below, which were populated by several small farmsteads and orchards. I’ve not heard of the term “the highlands” in reference to the Alameda ridge, but it could be. The newspaper story might shed light on that: was the view off toward the fire at the highlands? Maybe that refers to the ridgeline we think of today as Forest Park, also called the Tualatin Mountains. Hmm. Check out the article I’ve written about the Pearson Farm, which actually refers to a forest fire just adjacent to Gravel Hill. Yes, you’re absolutely correct about the geology. Doug, could you shed some light as to why and when the western portion of Alameda Park was separated off and made part of Sabin? The area is west of NE 23rd and north of The Alameda and also South of the Alameda between NE 21st and NE 19th. Maybe some history of the creation of Sabin? Hi Tony. Thanks for dropping by the blog. I will look into the specifics of Sabin and will post a plat map here in the next few days, but wanted to address your question: Alameda was not platted until 1909 and the earliest construction followed in 1910 and 1911. There are earlier houses (1905-1906) in Sabin. 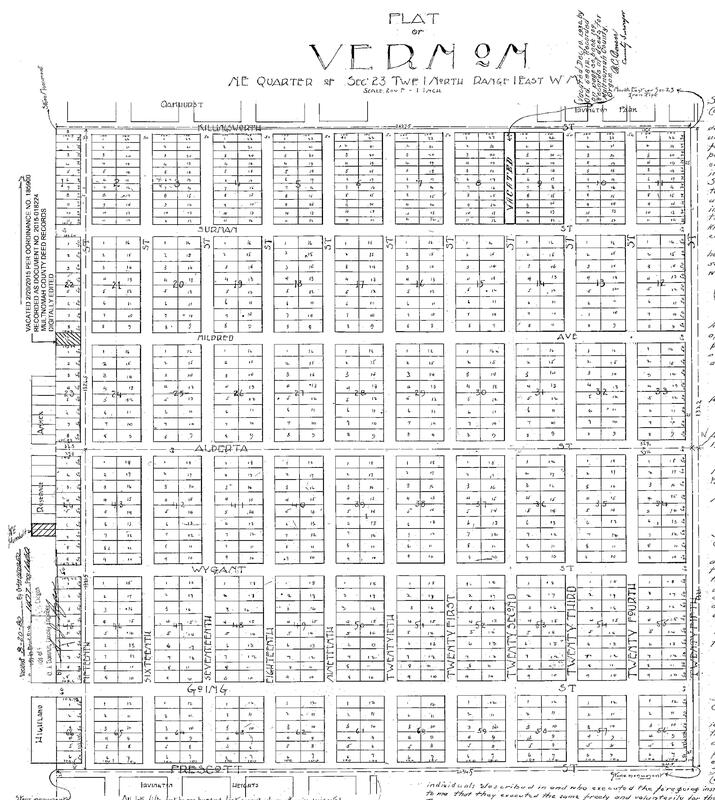 Interesting to note that the Vernon neighborhood, just north of Alameda Park across Prescott, was also platted and built before Alameda. Even though they are not part of the “Alameda Park Addition” proper (they are in “Homedale”), the houses on the west side of NE 21st between Fremont and Alameda were built in the 1920s, at the same time as most of the bungalows on the east side of the street were. Stay tuned, I’ll post the plat map soon. My house is on the West side of NE 21st near Ridgewood and was built in the “Alameda Park Addition” proper. 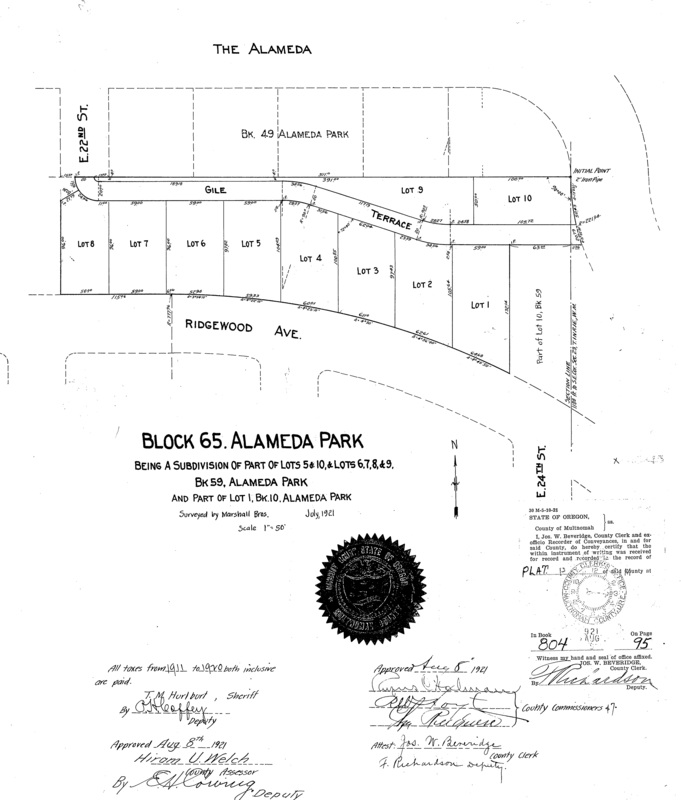 My deed says so as does the map of the Alameda Park Addition in this blog. Thanks for researching this. Doug, I have thoroughly enjoyed your website and its links. I grew up at 2415 NE 28th Ave. (near Brazee). I believe our house was built in 1911. My parents moved in in 1952. Us kids were always told the neighborhood was called Dolph Park, but the Portland neighborhoods book doesn’t have that. I know this area is not in Alameda, perhaps Fernwood. Could you point me to a source for learning a little about my old home area? Thanks. My old house at 2415 NE 28th Ave. (formerly 493 E. 28th St. North) is in the Bowering Tract. While this is a bit southwest of your old house, do you have any knowledge about the Bowering Tract? Thanks. I was delighted to discovery your excellent web site while researching street name changes in Portland. My grandfather’s home was located at 301 Glenn Avenue. Can you help me locate this street number on Alameda Park Avenue map? It appears that the numbering got changed as well as the street names. Hi Richard. Thanks for dropping by the blog…glad you enjoyed it. I’ve examined the early addresses on Glenn and all of the resources I have suggest that the Glenn (now 32nd Place) addresses run from 476 Glenn (now 2316 NE 32nd Place), which is just north of Thompson, to 1150 Glenn (now 5435 NE 32nd Place). Tell me a bit more about where he lived and let’s see if we can sleuth this out. You’ve got a great website here. I’m trying to find the original address of 3222 NE 37th – it was built in 1928. One of the Sanborn maps covers 1924-1928, but I’m having trouble locating the area online. The University of Oregon has a research paper in the School of Architecture library on the hill know back in the day as “dirt hill”. I will see if I can find a link online and post it. As a kid I remember playing on the hill before they built the stairs. I’m curious about a block numbering discrepancy. According to Portlandmaps, my house is in Vernon, block 53. But according to the plat map shown here, it is block 51 (I’m basing that on the street name). Does anyone know why that is? Is the Great Renaming/renumbering the reason for the difference? If anyone is interested, here’s what happened. 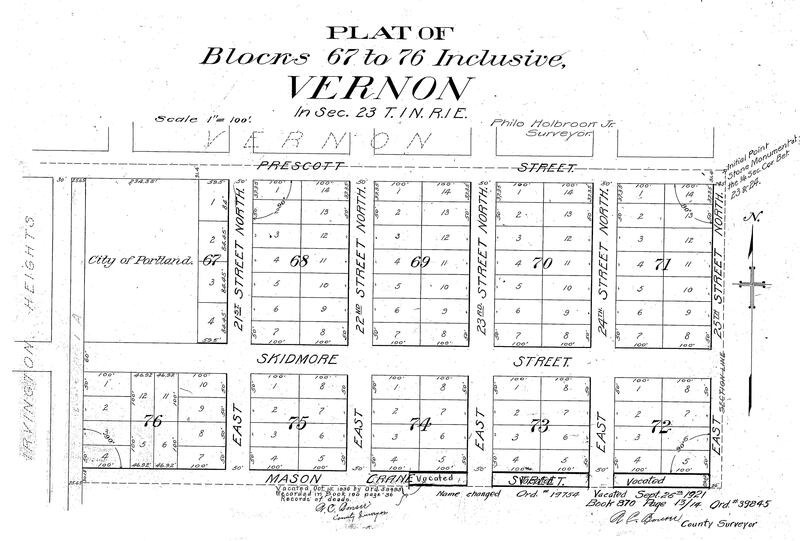 Vernon was originally platted in 1903, but on October 10, 1907, the City passed Ordinance 17118 that renumbered a bunch of streets across the city. Most of the streets in Vernon were reduced by one number. So if you live on 21st, it was originally 22nd, etc.